5-year-old Rukmandar has been bravely fighting a serious blood disorder for over a year now. Although he’s in constant pain, he’s determined to overcome this deadly disease. 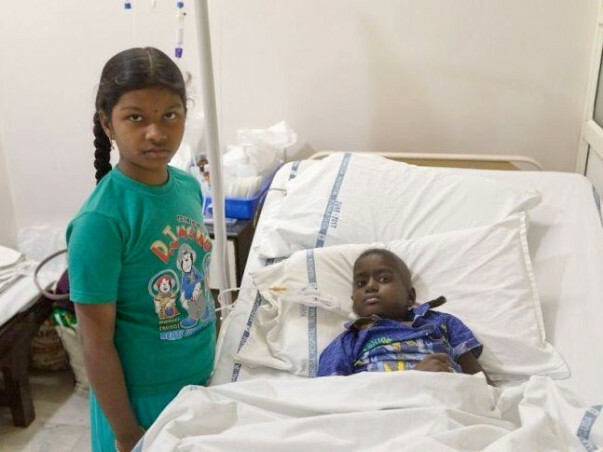 Rukmandar’s body will start giving up without urgent treatment, and the only cure for him now is a bone marrow transplant. 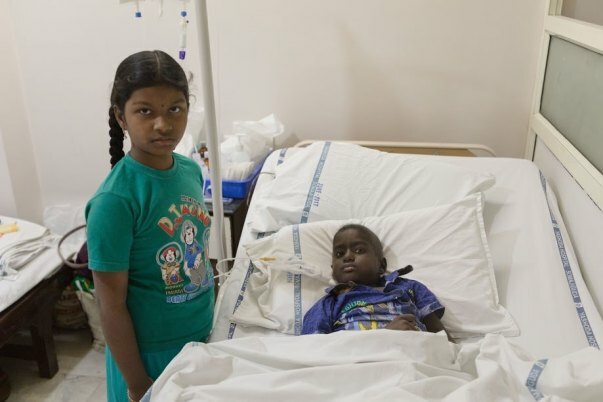 His older sister, Divya (11), is a suitable donor match. However, his parents are struggling to find a way to get him treated in time. Rukmandar has Fanconi’s Anemia, a rare disorder that affects the bone marrow which in turn decreases the production of blood cells. Two years ago, Rukmandar had a terrible fever. When Venkateshwarlu took him to the doctor, he was told that Rukmandar’s blood count was low and he needed a blood transfusion. Venkateshwarlu took his son back home, relieved that it wasn’t anything serious. However, in April 2017, Rukmandar fell sick again, and this time it was worse. 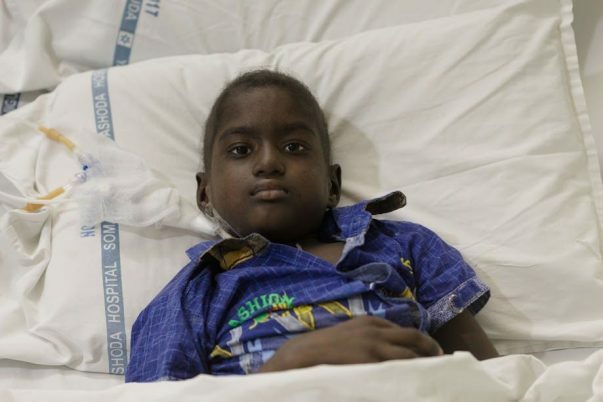 Rukmandar has bone marrow failure and his body has stopped producing the required amount of blood. This has put Rukmandar's life under grave danger. He falls sick very often, and each time it’s worse than the previous one. 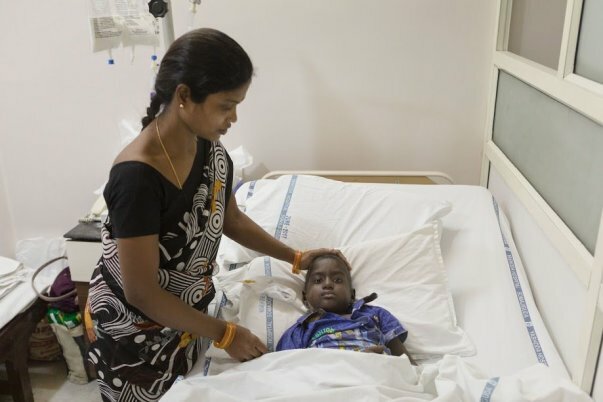 Rukmandar spends nearly 10 days in the hospital every time he falls sick. He doesn’t understand what’s happening to him and cries whenever he’s in the hospital, asking to go back home. 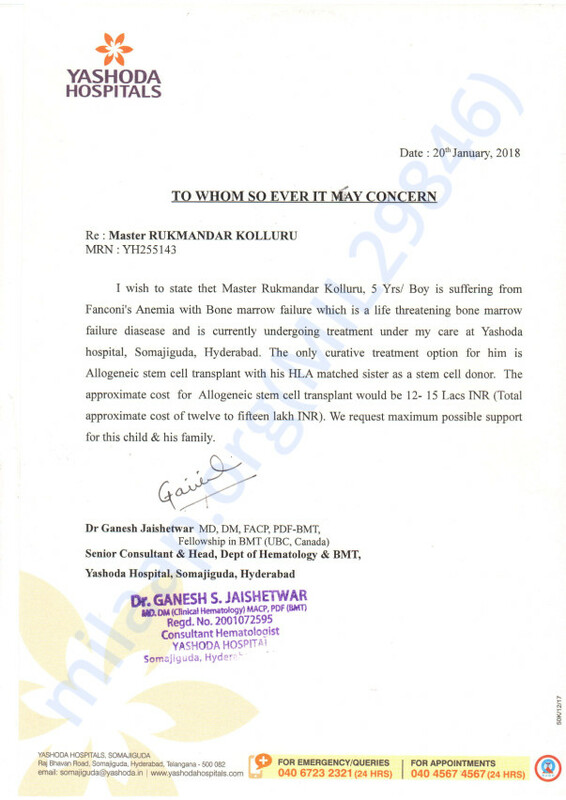 Venkateshwarlu has rented a small room near the hospital in Hyderabad. However, it's far from the warmth of their own house in Atmakur, Andhra Pradesh. Venkateshwarlu works in a small bangle shop in his town and earns just enough to meet his family’s basic needs. The amount required for Rukmandar’s treatment is out of his reach. Venkateshwarlu and Revati can’t imagine losing their son and are willing to do everything they can to save him. Divya wants to see her brother happy and cheerful again. 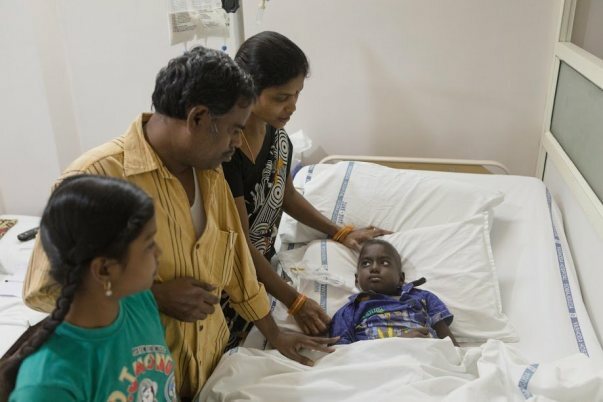 The family is waiting to take him back home, but Rukmandar’s condition is deteriorating. Without a bone marrow transplant, he might not make it. 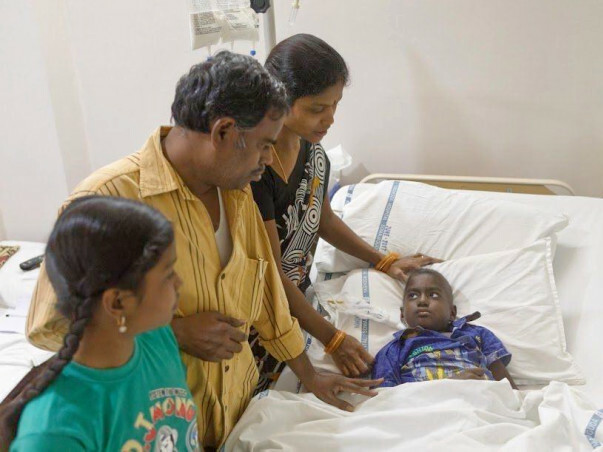 Venkateshwarlu has already spent 1 lakh on his treatment with help from friends and family, but he needs 15 lakhs to save his son from succumbing to this fatal disease. A timely bone marrow transplant can save him. Rukmandar has a serious blood disorder that is making him weaker as the days go by. He can’t go on any longer without a bone marrow transplant. 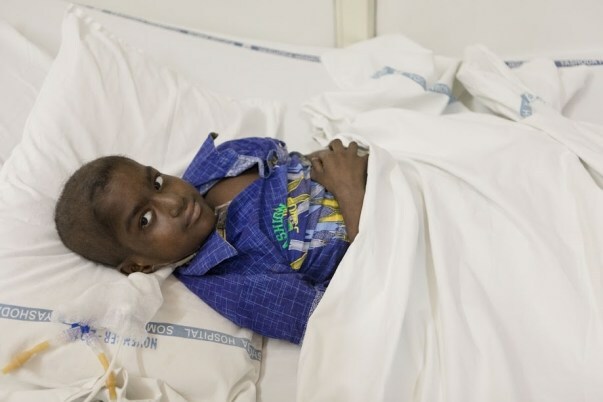 His sister, Divya, is a suitable donor match, but his father can’t afford his treatment. Vekateshwarlu works in a bangle shop, the earnings from which are not enough to pay for the transplant. Rukmandar needs your help to make it. Your support will ensure Rukmandar gets the urgent treatment he needs. Rukmandar passed away on 16th February 2018 in the evening time. He fought really hard and endured a lot of pain in his last days. 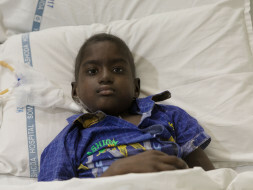 He was shifted to ICU and was on the ventilator but that was not enough, doctors tried their best but could not save him. The main reason for his demise was respiratory problems, his lungs could not function without the ventilator. We are grateful to all the supporters who came and helped in the time of need. The funds raised will used for his medical expenses so far. Wish him very all the best and fast recovery. God bless the boy! !